The NTS-HX220 compass series utilises our latest GPS compass engine, capable of receiving all GNSS signals, including Galileo. 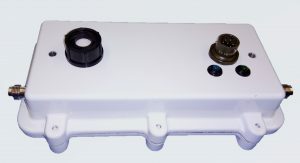 The primary electronics are mounted within an IP66 enclosure designed for use with remotely mounted antennae. Alternatively, a standalone system is available that integrates two high performance GPS antennas at 1.0m separation.